As per Solar Arc, Mars is active in this year, because the Mars – Ketu Axis MidPoint, Mars – Uranus axis MidPoint and Mars Neptune axis gets activated. Note that Mars is the lord of her fifth house of love. Transiting Jupiter will be opposite to natal Jupiter. Jupiter is the lord of her ascendant and the fourth house of emotions and satisfaction, home and hearth. 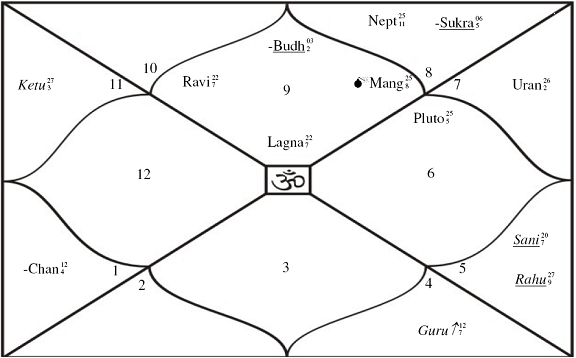 Transiting Jupiter will be debilitated and in conjcuntion with Rahu. Jupiter and Rahu will transit through the second house of family. Ketu will transit over natal Jupiter. Love issues seem to be prominent. She may be hurt in love matters. There are scopes that her long term love with John Abraham may be severed. Her creativity and acting skills may be under severe pressure. Her mentality and confidence may be down and low throughout the year. Relations with family members may be under stress and any plans of making her own family may meet with failure. In the last quarter of the year, any of her released movie, will court and meet with strong criticism. She may also opt for scandalous relations as a mode to release the steam that has gathered throughout the year due to failures in love. She may fall sick in the months of May, June and July 2009. There could be an accident too or hospitalization in the second and third quarters of 2009. She may sell of her home or house or change residence. Ganesha feels that the year 2009, may not be the year which she may want to relive again. Wishing Bips, all the best in 2009.